We forgot to take a padlock to Paris! TripAdvisor never said a word about it. Ditto Rick Steves. Same for Fodor’s France. I don’t know when this became a thing, but the bridges in Paris are slowly being overtaken by padlocks. The newest symbol of a couple’s enduring love. 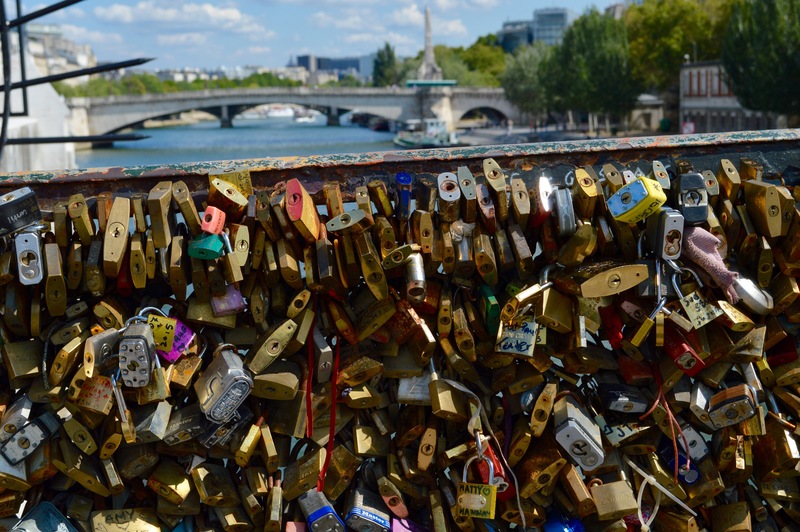 Seeing all that gleaming colorful hardware reflecting the sunshine of a bright Paris afternoon, I had to wonder how many of those couples are still— well, you know, still a couple. Or is the padlock a symbol of a love that no longer exists? Christians hold the Cross of Christ as the greatest symbol of God’s love for mankind. For on it Jesus offered Himself as a sacrifice for our sins. But among the sites and relics of the Holy Land you won’t see the one that most definitively and beautifully symbolizes God’s love for us. The Cross no longer stands on the hill called Golgotha, but the love demonstrated there is as deep as ever it was. Maybe you’ve been distracted by life’s busyness and haven’t been thinking of God. He’s been thinking of you. In Psalm 139 David captures the depth and intensity of the love God has for you. Let it refresh your heart with a new awareness of His constant abiding love. it is high; I cannot attain it. . .
There’s no one, no one, who knows you as God knows you. Every hurt and regret, every habit and character trait. Your thoughts and motivations, your hopes and disappointments—He knows them all. David says this truth is just too lofty, too marvelous to comprehend. He can’t really wrap his mind around the way God knows and loves him. He’s written on this theme before. More than can be told. How do you respond to that kind of love? Respond by returning it in kind. Take some time today to think about God. List a few of the things you know about Him. How would you describe His ways, the things He does and how He does them. Proclaim it! Tell somebody about it! What do you think is God’s greatest desire? What fills Him with joy and delight? The more you discover Him, the more you’ll love Him. In all my troubles and all my thoughts. I find peace and joy in knowing that God loves us so. Precious post and scriptures shared Kelly. Padlocks,really??? Made me smile. Ah! Paris.